GUCCI is one of the most popular and luxurious Italian fashion houses that was established in 1921 in Florence by a famous designer Guccio Gucci. Guccio started his career as a manufacturer of leather suitcases. Soon he opened a shop for selling clothes for jockeys and accessories for horse riders, which were made from leather of the best quality. As the GUCCI line has gained its success and respect, the company began fabricating exclusive bags and clothing items for men and women. The children collection was represented much later. But in all its items the logo of GUCCI surly prevails. The designers work on the uniqueness of each product and try to provide children aged 0 to 16 with clothing of the highest quality and chic look. Floral dresses with ruffle collars, stripped T-shirts, hooded sweaters, jeans and lightweight jackets are made of natural fabrics, such as 100% cotton, denim, leather, silk, chiffon, wool and others. The GUCCI line offers to young children a big variety of accessories to complete the perfect appearance; among them are colorful silk and cotton scarves, cool braces and elasticated belts. Baby bibs sets will be a good gift for newborns. The products of GUCCI can be purchased online. Baby Gucci clothing collections really impress, it does not matter do you want to buy new season collection or some sales items, every time it looks gorgeous. shorties (blue, white, pink, grey, navy blue knitted cotton GG logo). Gucci shortie sets also available and come in gift box. 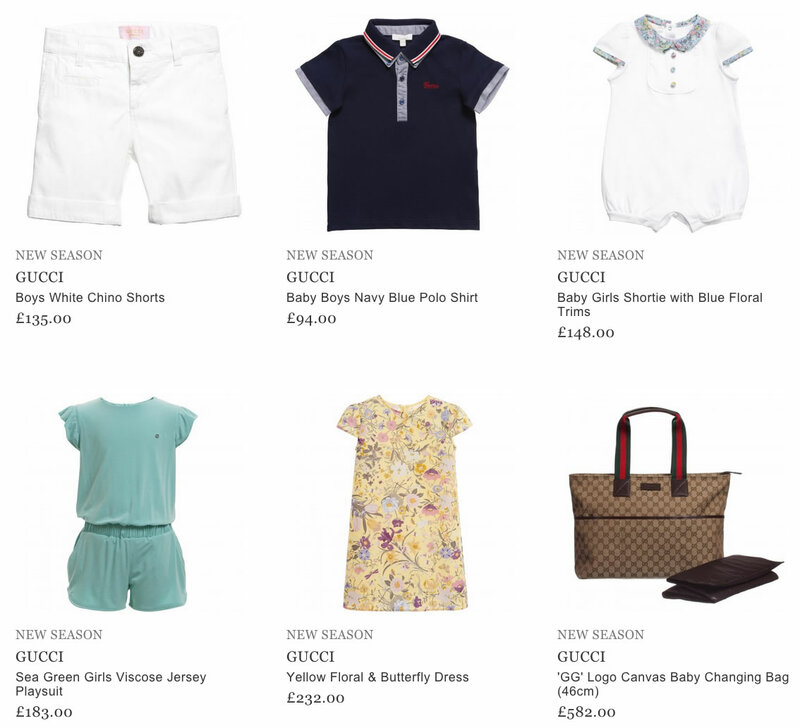 If you prefer when your baby wears “adult” like clothing, or you have some special occasion, you can always find something special and luxury in Gucci baby collections. Sure, small baby or toddler do not understand what fashion or style is, but you will be pleased every time when you wear your child in Gucci apparel. When kids grow up they start to be interested in fashion, now they have a personal opinion about clothing, about personal style… and there is no need to buy something your child does not like, just show him or her beautiful things and give him/her a choice. We are sure that if you will introduce Gucci branded clothes to your child it will be Love at First Sign. It is hard to find a person who does not like all these luxury Gucci apparel. 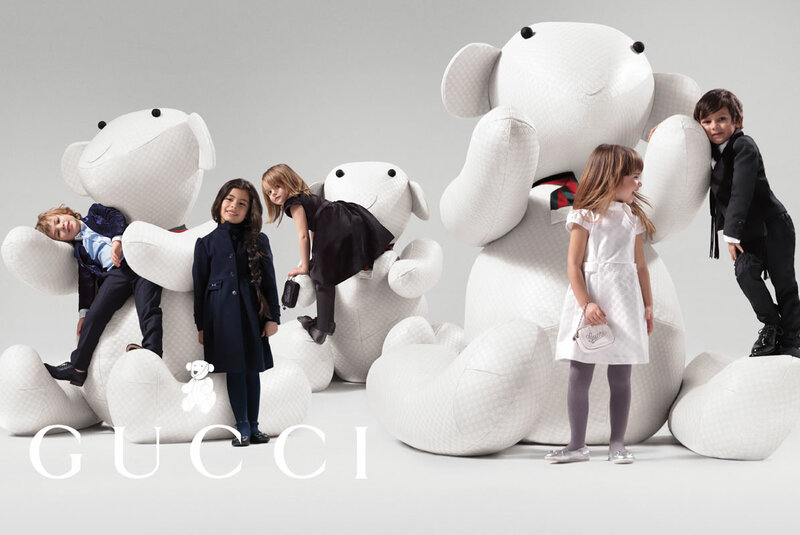 Gucci offers boys and girls clothing for everyday life and for special occasions & parties. Wearing high-quality clothing and shoes from the first days of their life your kids will have no problem with good taste and fashion style in the future adult life. trousers & shorts for boys and girls by Gucci are amazing too. Different colors and styles, sports and classic look; we have about 50 different types of pants & shorts, check them all. We want to point out that Gucci has Mini Me line in its collections, it means that you can buy the same clothing models in adult collections for men and women. If you like family look style Gucci Mini Me exactly what you need. Check our online boutique regularly, Gucci kids clothes and accessories are so popular among our customers that some times you can miss the new model or size. hi im looking for a boys gucci belt ,dicky bow and matching braces….his size would be age 9-10 in clothes thank you..